Ginger Carrots, a Great Side Dish sure to please the kids! My mom had this side dish when she was traveling to Bhutan. She came back raving about them and then made them for my son. He brought some home, but I was only allowed to have one bite so I could figure out how to make them for him. He LOVES them and what a great way to get veggies into his diet. Below is my recipe, slightly altered, based on my one allowed bite and tasting as I go. 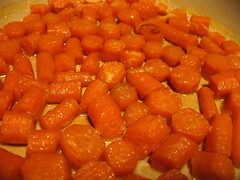 The recipe is very simple and easy to make, but does take some time (~30 minutes) for braising as carrots are hard. However, if you start this dish first or a day or two ahead, you can easily make it for a week night dinner side dish. My mom provided another time saving tip: You can microwave the carrots in a little bit of water to soften them and speed up the cooking. 16 oz bag of baby Carrots, sliced about 1/4 in thick. Or 4 cups of sliced carrots. The thinner they are sliced, the faster they cook. 1.5 – 2 cups Orange Juice enough to cover all of the carrots, with or without pulp. Your choice. I prefer some pulp. 1 TBS fresh Lemon Juice optional. This is not in the original, but I like the flavor it adds. In a large skillet, add about 1 TBS of olive oil, 3 TBS of butter, garlic and ginger and heat over med heat until butter is melted and ginger/garlic is soft. About 2 minutes. Add in the carrots. Increase the heat to med-high and saute the carrots, a pinch of salt and pepper for about 3 minutes or until the carrots just begin to get soft. Add in the orange juice and cover. Let braise for about 15 minutes, or until the carrots are soft and done. You can also finish with a little lemon and/or orange zest or chopped parsley. If you want to spice it up a bit, you can toss in some diced hot peppers (about 1 TBS of diced jalapeno should do it). Add them when you are sauteing the ginger and garlic. Add in leeks or onions would also be really good. You can add the fresh sliced leeks or onions when you saute they ginger and garlic. I have made this with Orangina when that is what I have in the house. It turns out well too.. Just a little sweeter. If you don’t have 2 cups of orange juice, you can substitute with vegetable stock and add a pinch of sugar. I hope you enjoy and aside from the butter, these are very healthy. If you wish, you can reduce the amount of butter and add a little more olive oil. But some butter keeps this tasting yummy.. But then again, what isn’t yummy with butter? Posted by culinaryease on May 15, 2011 in Cooking for two or less, General Cooking, Recipes, Side Dish, Vegan/Vegetarian and tagged Carrots, Ginger, Orange juice, Oranges, PostaWeek2011.